For some reason, I can’t get interested in the Democratic National Convention, just as I was unable to muster any interest in the Republicans’ meeting last week. Maybe it’s post-surgery brain — inability to maintain focus for an extended period — or maybe it’s just that these affairs have become so prescribed, even with a little yelling and booing. The last political convention that held some element of drama was the Republican convention here in 1976, when Ronald Reagan battled Gerald Ford to the wire. I was assigned to follow Reagan during that convention and, naturally, that held my interest. I loved the conventions back in the late ’50s and early ’60s, when network TV was just figuring out how to cover these conventions at floor level and god-like anchors such as Walter Cronkite of CBS and Chet Huntley and David Brinkley of NBC narrated the proceedings. As a kid, I thought those black-and-white images, with reporters getting bumped around on the convention floor, were just too good to be true and had no idea it would become commonplace with the polishing of TV production. …That said, I do like some of the stories that come out of these conventions, and Maureen Dowd of The New York Times had one yesterday that should hold appeal to nearly everyone about my age. She wrote about Colorado Gov. John Hickenlooper’s memory of attending a 1969 Janis Joplin concert in Philadelphia. In 1969, Janis was on her way to becoming a full-fledged star but had not crested. Some of you will remember that I wrote a career-changing story about Janis in June 1970, when I was a rookie reporter at The Star. That story catapulted me from the ranks of obit writer to genuine general-assignment reporter. It was published on Page 3 of The Kansas City Times the morning of June 15, 1970. Four months later, Janis died of a heroin overdose in a Hollywood motel. …Another quick preface, I have more than a passing interest in Hickenlooper, a Democrat, because the first time I spent considerable time in Denver (2012 women’s Final Four), I scouted a few bars and planted myself at one called Wynkoop Brewing Company in the LoDo area. LoDo — Lower Downtown — is a steroids version of the Crossroads District. It is anchored by Coors Field, which is down the street from the Wynkoop brewery. Wynkoop was home base for the Notre Dame women’s team (every year, each Final Four team designates a bar for its fans to gather), and I settled there. I soon discovered that its co-founder was Hickenlooper, a Pennsylvania native who had started out as a geologist in Colorado and then hop-scotched into the bar business and then to politics…It felt kind of special hanging out, with the excitement of a Final Four all around, at a vibrant bar founded by the governor. “It was 1969. I lived in Philly. I was going to Haverford High School and my 24-year-old brother, Sydney, was alarmed at my lack of dating. He was the one who introduced me to things that were … temptations. He went to Wesleyan, same school I went to. He got a master’s in urban planning but he never used it. He became an automobile mechanic in Berkeley in 1973. “My dad died when I was a kid. I had just turned 8 but he’d been sick for two and a half years. He had intestinal cancer. Anyway, my brother raised me to a large extent. He was seven years older and he knew what was hip. He decided he was going to set up a double date. So he asked which girls I knew, and he stood beside me while I made the phone call and then I had a list of, like, six conversation topics so I wouldn’t run out of things to talk about with this girl I hardly knew, Sherry Lefevre. “And he said, `You gotta come see this band, they’re really good.’ So he got the tickets and we went down to the Electric Factory & Flea Market to see a band called Big Brother and the Holding Company with Janis Joplin. Well, I didn’t know who she was but I immediately went and bought the record. 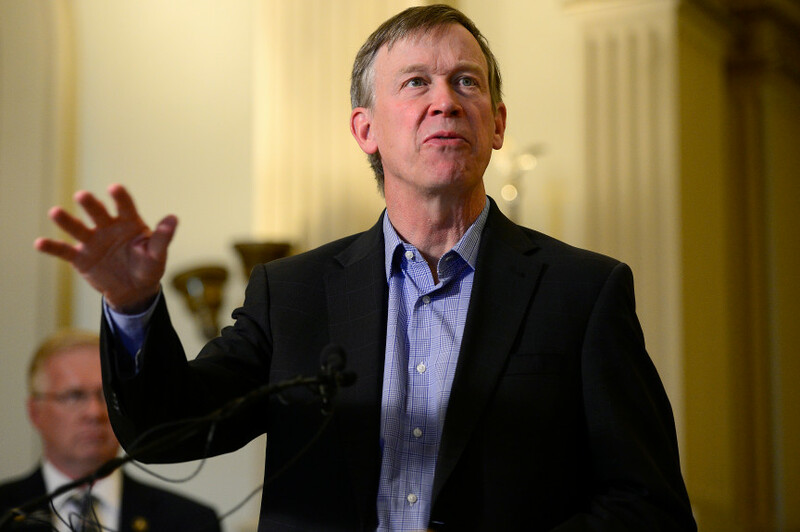 “Down boy.” Maybe the two sweetest words John Hickenlooper ever heard. Hickenlooper, who had been mentioned as a possible running mate for Hillary Clinton, will speak at the convention tomorrow night…That’s one speech I’ll be watching. Maybe it should be Hillary’s campaign theme song. Thanks for getting the comments off to a rockin’ start, Leigh. A spectacle of politics and artifice. But it’s too bad you were absent. Last nites DNC production was truly a cavalcade of accomplished strong women from all corners witnessing to the long slog of women’s right’s culminating in a women for president. We don’t get to see this order of magnitude often enough. And few can top a Slick Willie speech. To miss this convention nominating a women for president for the first time is to miss a piece of history. It was a joyous celebration and it was fun to watch. There’ll be plenty of time this fall to dissect the sausage making. Enjoyed your column and so glad you are feeling better. But am sorry if you did not hear Michelle O’Bama the other night. She was magnificent. And Bill Clinton was great last night. Hope you don’t feel like hell anymore. Btw, why did you? Laura and Jayson — You’re absolutely right that it was a historic occasion. By all accounts, the speeches — last night’s and Michelle’s on Monday — were outstanding…I’m going to attribute my inability to get interested to the recent surgery. I’m coming around, feeling better every day, but extended concentration is still pretty difficult. I spent time last night and this morning producing this post. Normally, I could knock something like that out in an hour or so. Thanks for the reply but take your time recuperating. No need to rush it. Just relax. It’s takes a while to get your strength back. Take it slow–or slowly. I just didn’t remember feeling “like hell.” Either it’s that — I DON’T remember — or, I had better drugs! Part of the problem was I resisted the painkillers for a couple of days, right after getting out of the hospital. I’ve now seen the light and feel a lot better. Ah, yes. No time to be noble and brave. Glad you’re feeling better. Thanks, Will. I do get the feeling I’ll make steady progress. I got outside today and walked with a cane. Felt pretty good. He said he’d give me everything in sight. Said he’d give me everything in sight. you take the stars out of the night.